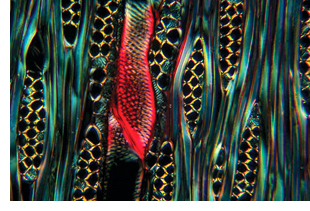 Excerpt: In our last issue, I discussed why ongoing microscopy training is essential for working microscopists to remain relevant in their field of research. That got me thinking about the other important aspect of the vocational path: an education and employment roadmap for those considering a microscopy career. I found this article on www.study.com (a self-funded education website) and think that it offers an accurate and thorough job description and roadmap for becoming a microscopist. 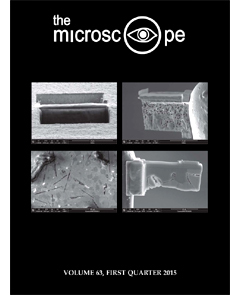 Abstract: Focused ion beam (FIB) has become an emerging star in microscopical analyses, especially in materials research, and its applications, including ion beam sectioning and site-specific transmission electron microscopy (TEM) specimen preparation, provide valuable subsurface information on morphology, chemical composition profile and crystallographic orientation relationships. However, one of the ongoing concerns is the specimen heating during Ga ion beam milling that can produce unwanted artifacts during FIB work. Theoretical calculations of maximum specimen temperature increase noted in literature are mostly based on two assumptions: a primary ion beam implant into a substrate of infinite size and steady-state heat dissipation in substrates. There has been no study to assess temperature increase during TEM specimen preparation, especially during the final stage of ion beam thinning, where specimen heat transfer becomes one-dimensional. Assessing temperature increase in FIB specimen-preparation process is of paramount importance, especially for low temperature alloys, because phase transformation and precipitation can happen at a relatively low temperature. Abstract: The analysis of talc powder for asbestos is most appropriately done with a combination of polarized light microscopy (PLM), transmission electron microscopy (TEM) and in some cases a screening by X-ray diffraction (XRD). Low levels of thin asbestos fibers in talc may only be seen using the TEM analysis. Although never formally adopted by the U.S. Environmental Protection Agency (EPA), the 1993 EPA bulk method (EPA R-93) for asbestos provides the basis for the PLM portion of the method, as it is a good description of the light microscopy techniques available. The consensus method D6281 balloted and published by ASTM International provides the basis for the TEM portion of the method. The method described here has been used to investigate vintage talcum powders and talcum products currently available. Some asbestos has been found in vintage powders but with the exception of one Chinese product, asbestos was not detected in currently available powders using the talc-asbestos method described here. Excerpt: It is time to celebrate. The first popular science book in the world is 350 years old this year — and it was a volume devoted to the world of the microscope, aptly titled Micrographia. Our modern era is dominated by the indulgent irrelevance of fairytale physics that no one understands, so a hands-on, relevant subject like microscopy attracts little popular interest. Back in the intellectual dynamism of the 17th century, microscopy was a major talking point. The book’s author was a multi-talented pioneer named Robert Hooke. What a series of paradoxes he poses. Hooke was born on the tiny Isle of Wight, yet became one of the greatest figures of early science. In spite of it all, he was destined to be forgotten by the world at large. Hooke was a drug addict who had an affair with his teenage niece, wrote extensive personal papers that were believed lost forever (they recently turned up in the back of a cupboard in a handsome house in Hampshire) and was satirized on the stage. When a popular biography was recently published with his portrait on the cover, the picture turned out to be of someone else entirely. Hooke’s life is one of perplexity and confusion. News | Two New Leeuwenhoek Microscopes? Excerpt: Microscopes made by the Dutch pioneer Antony van Leeuwenhoek have intrigued me since I was a teenager. Although all of his microscopes are now believed to be accounted for, two more may have possibly been discovered. One is a small silver object in a box of oddments found in the desk of a dying silver merchant, and the other is no more than a scrap of dirty metal dredged from a Dutch canal. Both items were immediately brought to my attention for an opinion. Excerpt: Often a microscopist has the task of examining debris. The goal may be to find a particular target item, or it may be an evaluation of the types of materials present. Whatever the task, patience and a meticulous approach are required. Hours and even days can pass as the examination progresses. Interruptions that may occur could cause the analyst to lose the distinction between examined and unexamined debris. This article describes a convenient container for the examination of debris. This container will help with the removal of unwanted debris, maintain the distinction between examined and unexamined debris, and provide a secure means for storing the sample when there is a break in analysis. Excerpt: James ‘Jamie’ Nelson, who died on March 17 at the age of 101 in London, was an ebullient Scottish physicist, X-ray crystallographer, mineralogist, gemmologist, inventor of scientific instruments and a founder of McCrone Scientific Ltd. in London. Dr. Nelson’s more recent scientific interests centered on gemmology, which he started at an age when most people retire, but his contributions to the scientific world were more wide-ranging. As managing director of McCrone Scientific Ltd., his inventions were numerous, including the McCrone Micronizing Mill, which has received much acclaim from users of X-ray diffraction. His many more recent gemmological instruments were manufactured and sold through Nelson Gemmological Instruments. Originally published in The Microscope and Crystal Front, Vol. 14, No. 11, July – August 1965. Excerpt: This year The Quekett Microscopical Club celebrates the centenary of its foundation on 7th July, 1865. The title of the Club commemorates the name of John Thomas Quekett, Professor of Histology and Conservator of the Hunterian Museum at the Royal College of Surgeons in England. A prominent microscopist in his day, a founder member of the Microscopical Society of London (now the Royal Microscopical Society), Fellow of The Royal Society and of the Linnean Society of London, and author of the ‘Practical Treatise on the Microscope,’ Quekett died in 1861 at the tragically early age of forty-six, greatly respected by all who knew him. Excerpt: Leica Microsystems has launched two Wi-Fi capable microscopy instruments with high-definition (HD) quality for the science classroom: the Leica EZ4 W educational stereo microscope with a built-in wireless camera and the Leica ICC50 W digital camera, which can be installed in the manufacturer’s educational compound microscopes.